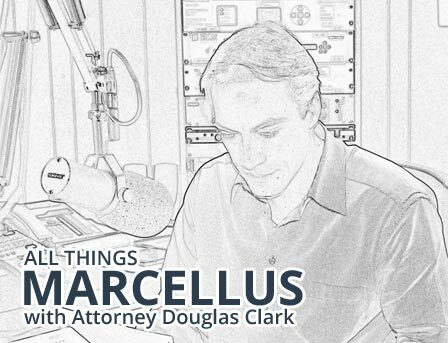 In this version of All Things Marcellus, Doug explains The Clark Law Firm’s review and consultation legal services related to any contracts or agreements related Marcellus Shale, Utica Shale, or other oil and natural gas development in Pennsylvania. Doug stresses the importance of getting oil and gas representation and information before signing any documents presented by the company. Doug dives into how gas companies send Pennsylvania royalty owners documents and contracts in the mail and ask the landowner to sign the documents and return them in the self-addressed stamp envelope provided. On this week’s version of All Things Marcellus, Doug discusses how energy companies and mineral acquisition companies overreach when presenting documents and contracts to landowners wherein they present extremely Company friendly terms with massive loopholes that benefit the company or Buyer of oil, gas and mineral rights and work against the landowner and natural gas right holder. Doug addresses landowners considering buying or selling oil, gas, and mineral rights. Segment provides detailed information as to how brokers, investors, and hedge funds invest in buying oil and natural gas rights from Pennsylvania landowners. Doug fully explains how the market operates in purchasing oil and gas rights in Pennsylvania. Doug discloses how landmen and brokers operate in many cases to flip sales agreements to purchase natural gas rights to other investment entities. Why landowners must be very cautious when considering permanently selling and divesting their oil and natural gas rights. Oil and gas rights owners must negotiate the price if they are considering selling the gas rights as well as the language in the purchase and sales agreement as well as the final deed. Mistakes can be costly and last forever. Doug promotes his free oil and natural gas seminar for Pennsylvania oil and gas right holders and the value of oil and gas negotiation experience. Doug explains how oil and natural gas companies send cold letters to natural gas rights holders and requests that the landowners simply take the enclosed legal documents to a notary and sign and return the letters to the gas company in a self-address stamped envelope. Landowners who receive letters from companies requesting to execute powerful legal contracts must be extremely cautious and seek experienced oil and gas counsel. Landowners should never sign oil and gas agreements without consulting with an experienced Pennsylvania oil and gas attorney to understand the contracts, their rights and potential opportunities to negotiate offers presented by the gas or pipeline company. Temporary Work Space Agreement Show and other important natural gas development topics. Reminder for the Clark Law Firm free landowner seminar on June 15th at the Dean’s Center in Wellsboro, Tioga County. There is a strong need for Pennsylvania landowners to get legal assistance from an experienced oil and gas lawyer prior to entering into any oil and gas agreement. Landowners must not rely on the gas and pipeline company landmen to educate them. We have the opportunity to learn from the past mistakes of others and the evolution of the oil and gas industry in Pennsylvania. Doug discusses the value of learning from experience from negotiating oil and gas agreements and observing natural gas development trends. Explanation of the gas right owner benefit from an initial review and consultation regarding any gas or pipeline agreement offer. When I signed my initial gas lease in 2006, I was totally unaware and was ignorant of what was all involved. I signed with the belief that the landman was being honest and upfront with the terms and explanations of the lease and that I could trust that he was looking out for my best interests. I could have never been so wrong! As I later found out, many things were incorrectly explained and represented regarding my gas lease. It was at that point I decided that if I ever was presented with any gas lease renewal or anything natural gas related, I would seek out legal help before signing anything. In May of this year, my opportunity came. A company that was working with the company I originally signed with offered a top lease. At first I decided to talk with the landman myself as I had educated myself alot through internet webinars and various websites about things I should ask for. After about one week of trying to negotiate with the landman and basically being fed a bunch of bologna, I decided that I needed to find an HONEST, REPUTABLE, and EXPERIENCED gas lease attorney. I spent several hours online and on the phone searching for someone that I was comfortable with representing me. I wasn't comfortable with the first two attorneys that I spoke with. One charged on a royalty percentage basis, and the other made me feel like I was wasting his time. Luckily, Attorney Doug Clark was the third attorney that I called. I spoke with Marceea and she was very friendly, knowledgeable, and gave me all the time that I needed to answer any and all questions that I had. I knew from that conversation that I had found the right attorney for the job! My first conversation with Doug lasted well over an hour and he explained many of the terms of the gas lease and addendum as well as answered all of my questions. He was very concerned with what I wanted from the lease and what protections I hoped for in regards to my property. If any question or concern arose after that, I simply either emailed or called Doug and it was addressed very quickly. I can sincerely say that I am VERY pleased with The Clark Law Firm! I am confident that I made the right choice in selecting Doug to handle my gas lease negotiations. I have already recommend him to all of my friends and neighbors, at least two of which I believe are also going to be clients of Doug. I feel that anyone that has a gas lease or anything related owes it to themselves to call and speak with Doug before signing anything.